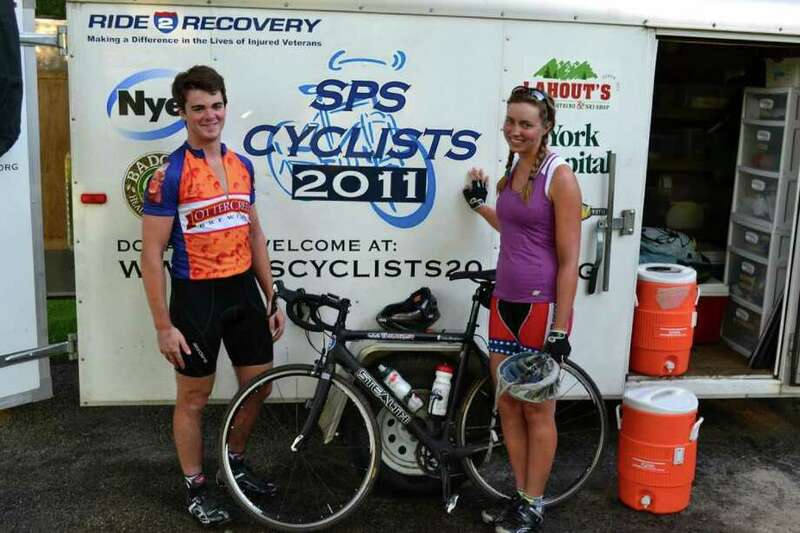 Tucker Burleigh (left) and Lia Keyser were part of a group of seven students from St. Paul's who rode across the country this summer to raise money for Ride2Recovery. Thousands of miles in conditions ranging from blazing heat to torrential downpours, numerous crashes and dozens of flat tires didn't stop a group of St. Paul's School students from completing a cross-country charity bike ride. Students from the Concord, N.H., school have been cycling across the country for 12 years, and this year's group, composed of four girls and three boys, chose to raise money for Ride2Recovery which helps wounded veterans with their rehabilitation. Darien resident Tucker Burleigh was one of the teens who accepted the cross-country challenge. "Historically this is the sixth time a group of St. Paul's kids have organized a bike trip," Burleigh said. Before putting rubber to the road, the group had to choose a charity, determine their route and plan a hundred other logistical necessities for a trip across the country. After settling on Ride2Recovery, the group chose to take a northern route across the country because they wanted to bike in cooler weather, Burleigh said. The finalized route took the group from Washington, across 11 states and part of Canada to their destination point of York, Maine. Upon arriving in Maine, the group completed a trip of 3,438 miles that lasted from June 16 to July 29. The group of cyclists began planning their trip in the fall and spent time sending out letters to secure donations. Even though St. Paul's wasn't associated with the charity ride, the school gave the group a $5,000 donation, Burleigh said. After months of planning, the trip began with the group dipping the rear wheels of their bikes in the Pacific ocean before riding through the Cascade Mountains which gave the riders a reality check that this wasn't just a leisurely bike ride. "Before the trip, I did four training rides of about 30 miles," he said. "On average, we were doing about 90 miles a day." Burleigh said the group was lucky in terms of weather because they didn't run into anything too severe until later in the trip. Unless there was a torrential down pour the group would push on through almost anything. One of the highlights for Burleigh was biking through the Rocky Mountains and cruising downhill after a grueling climb. "Coming down the Continental Divide through the rolling hills before climbing the Rockies and coming down wicked fast was truly amazing," he said. As the group made their way across the country they were met by more than a few well-wishers and members of the media. Burleigh said one of the most touching moments was after the group had stopped in Maddock, N.D., a small town of 372 people, on July 4. One of the members of the group was going to be celebrating her birthday and the group called ahead to see if they could get a reservation at a restaurant. However, the town was so small there wasn't a restaurant but the residents gathered and threw a party for the group during their stay. "This town had nothing and they threw us a party and gave us $150 in groceries for free," Burleigh said. "Getting the chance to meet people like that was amazing." Despite the generosity of small towns, the adrenaline rush of flying down a mountain at 40 mph and the nearly perfect weather, there were a number of obstacles the group had to contend with on their journey. "We had a ton of flat tires and I had 13 flats but they are super easy to fix," Burleigh said. "We also had a lot of crashes, two concussions, stitches and a lot of road rash." Burleigh proudly displayed his own wounds suffered during the trip with scabs covering his elbows and knees. Most of the injuries were relatively minor but one girl in the group crashed on the last day of the trip before the group finished. "On the last day she crashed and messed up her wrist but she finished the trip in screaming agony," he said. The weather cooperated for the most part for the group with only a few stops when conditions deteriorated to the point where it wasn't safe to ride. However, near the end of the trip, the group ran into the heat wave that scorched the east coast for a couple of days. By the end of the ride, the group had raise $87,000 and Burleigh said the thing he was looking forward to the most was the chance to sleep in his own bed. After a month of camping out in a sleeping bag for the majority of the trip, the comforts of home were more than appealing to him. "I camped out most of the time and by the time we finished I was really looking forward to sleeping in my own bed." Burleigh said he had the chance to talk to students at the New Canaan Country School about the trip but was hesitant to say he would get on a bike and trek across the country again anytime soon. "I would have to give it some time before I did it again but I might do it again; it's just such a huge trip," he said.